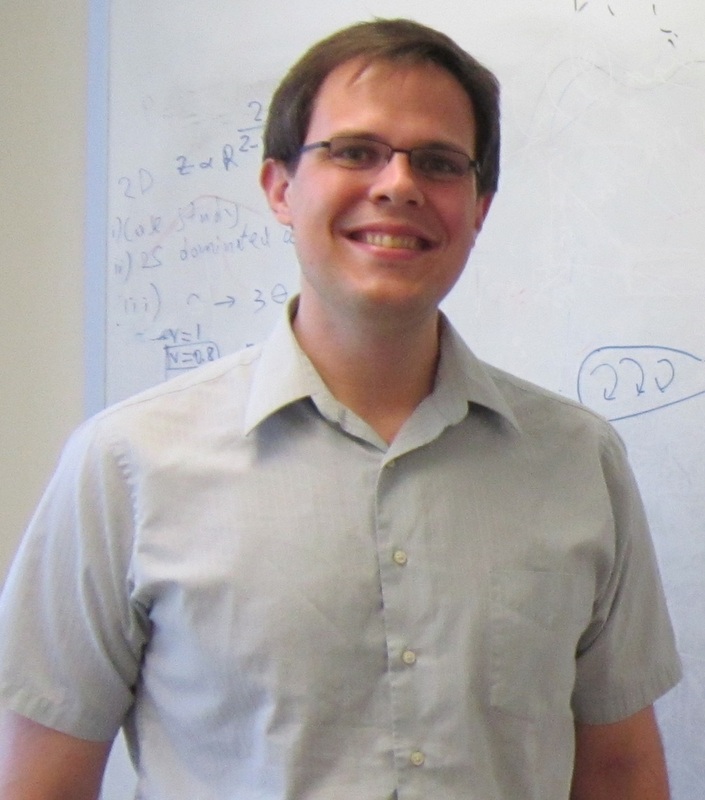 I am an Associate Professor in the Department of Physics at Columbia University. My Ph.D. was completed in the Departments of Physics and Astronomy at UC Berkeley under the supervision of Professor Eliot Quataert. Click here for my CV and publication list. I am interested in a broad range of topics in theoretical astrophysics, focused on high energy and stellar astrophysics. A unifying theme of my research is a connection to transient (or 'time domain') phenomenon, motivated by many sensitive, wide-field telescopes coming online in the next decade across the electromagnetic spectrum. I am excited by the scientific potential of the upcoming generation of gravitational wave interferometers, such as Advanced LIGO, and the promise for a future era of "gravitational wave astronomy". One area of my group's focus are theoretical predictions for the electromagnetic counterparts of binary neutron star mergers. Among the most promising counterparts is a day to week-long thermal optical/infrared counterpart, powered by the radioactive decay of heavy elements synthesized in the merger ejecta. 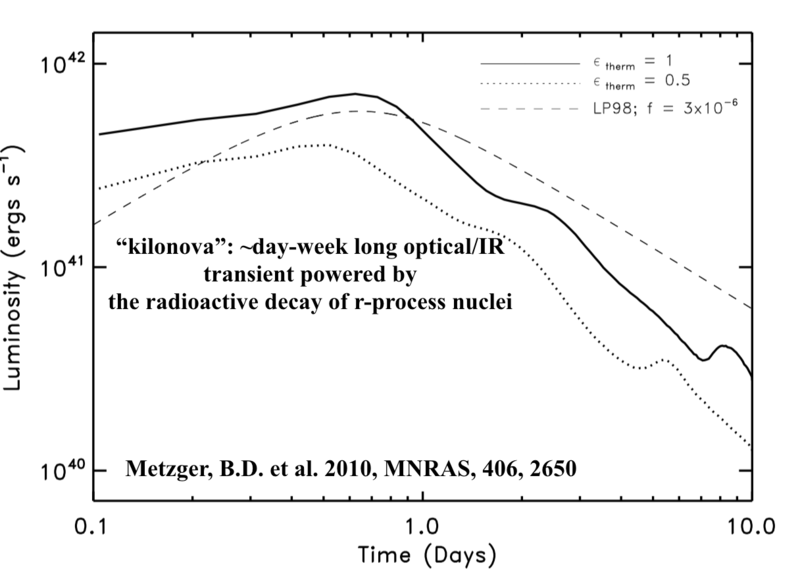 In 2010, our group made the first predictions for this so-called "kilonova" emission, which included a realistic treatment of the relevant nuclear heating. To the left, I show an example predicted light curve (luminosity as a function of time since the merger) from 1% of a solar mass of r-process elements ejected from the merger at 10% the speed of light. The discovery of kilonova emission following a binary neutron star merger would provide the first direct evidence for the production of rare elements such as Gold, Platinum, and Uranium. My list of publications can be found on astro-ph or the Astrophysics Data System (ADS). My Ph.D. thesis, titled "Theoretical Models of Gamma-Ray Burst Central Engines," can be found here. My dissertation was awarded the Dissertation Prize by the High Energy Astrophysics Division (HEAD) of the American Astronomical Society. In 2014, I was named an Alfred P. Sloan Research Fellow. In 2018, I was named a Finalist in the Blavatnik National Awards for Young Scientists. I was born and raised in Burlington, Iowa, along the Mississippi river. If you are in the area, check out the Southeastern Iowa Astronomy Club and the Witte Observatory. While at Berkeley, I was captain of the Physics Department basketball team "Net Force". I enjoy following politics and have become interested in history, particularly of New York City.